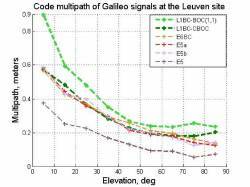 (Updated May 22, 2009) Leading researchers from Ohio University, Stanford, and the University of Colorado have released their initial observations of the GPS L5 signal broadcast, including an anomaly in SVN49’s L1 signal reported by the GPS Wing’s chief engineer on May 4. The U.S. Air Force switched on the eagerly awaited, modernized L5 signal on April 10 after the successful launch of the newest GPS Block IIR-M satellite – SVN49 – in March. This was the first broadcast of a GPS signal in a frequency band dedicated solely for civilian use. 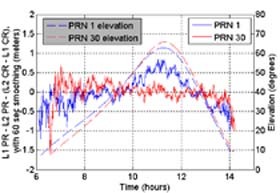 The Ohio University research team collected coherently sampled L1/L5 software radio data from its TRIGR instrument of the L5 turn-on event as well as complete data sets for both visibility periods of SVN49 for several days thereafter. Modernized Milestone: Observing the first GPS satellite with an L5 payload. 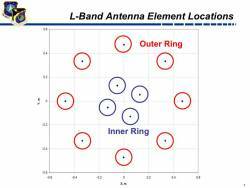 In order to observe this anomaly, the Stanford and Colorado researchers processed data from a receiver at Mauna Loa, Hawaii, which is part of the National Satellite Test Bed (NSTB) receiver network. The data set was recorded on May 5, 2009. As reported in Inside GNSS in a May 5 story on SVN49 and the L5 signal, the newest GPS satellite has proved to be a success with problems. At a May 4 session of the European Navigation Conference in Naples, Italy, Lt. Col. David Goldstein said signal anomalies characterized by the U.S. Air Force as “out of family” transmissions are keeping the latest GPS satellite from being declared healthy for months, if ever.